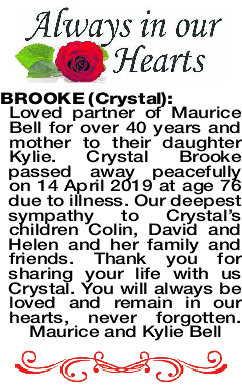 The Funeral Service for the late Crystal Brooke, formerly of Menora will be held at Acacia Living Chapel, 51 Alexander Dr, Menora, Entrance 2 on TUESDAY (23.04.2019) at 12.00 Noon. 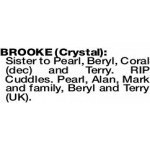 BROOKE CRYSTAL Sister to Pearl, Beryl, Coral (dec) and Terry. RIP Cuddles. Pearl, Alan, Mark and family, Beryl and Terry (UK).